Having grown up in Dallas, Tx., Dr. Albert Bimper Jr.’s experience attending Colorado State University (CSU) as an undergraduate was “very different” racially and culturally, he says. While some of his experiences as a student athlete were positive, at other times, it was challenging. Bimper says the professor helped him walk through the process of “Plan B,” keeping him under his wing when Bimper’s football dream started to fade away. This professor “had higher expectations for me, other than being a football player on this campus, and I appreciated that,” he says. After graduating from CSU in December 2005, Bimper deferred his graduate studies at Purdue University for a year, and had a “cup of coffee” in the NFL, playing for the Indianapolis Colts, he says, referring to his brief stint in the league. His rookie year ended up being a Super Bowl year. Once the 2006-2007 season was over, Bimper decided to return to Purdue for his master’s degree and to take up a graduate assistantship coaching. He found that the experience working with student athletes of color at West Lafayette, Indiana, paralleled his own as a student back in Fort Collins, Colorado. Both his master’s and then his doctoral work at the University of Texas at Austin (UT Austin) explored the range of experiences, identities and values of student athletes of color and how race and class intersect with a student athlete’s development and academic outcomes. Some of Bimper’s published research can be found in The Journal of Black Psychology; Journal of College Student Development; Journal of Sport & Social Issues; Race, Ethnicity and Education and Quest. In his current role, Bimper’s perseverance, tenacity and personal experience have allowed him to serve in dual roles, as an athletic director in charge of diversity and as an associate professor in the Ethnic Studies Department at Colorado State. While it may look slightly different than a classroom setting, Bimper grounds the programming of the athletic department, using ideas of thoughtful curriculum and pedagogy. 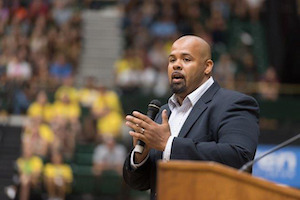 One program, the John W. Mosley Athlete Mentoring Program at CSU, partners with the Black Culture Center and student affairs administrators on campus, bringing mentors and former athletes of color to engage in discussions about race, identity or current political topics, such as the tradition of protesting. Because CSU is a land-grant institution, Bimper spent the past semester talking with students about being Black in the field of agriculture and its connection to the Black community, such as in addressing food insecurities or the Flint water crisis. And his courses, such as “Racial Representations of Black Athletes,” look at how Black sports figures have been “constructed at the interface of whiteness and White supremacy and how they’ve navigated that space,” Bimper says. His academic mentor has called his work unique and outstanding. Bimper hopes to model that student athletes have a range of interests and that they are “more complex than sometimes people want us to be,” he says. Students have come to Bimper for advice on multiple occasions, including after the Missouri protests and the NFL kneeling protests. “I try to offer a critical lens to our student athletes and to our campus and anybody that’s willing to listen about what I think, and how one might view those situations,” Bimper says. In an effort to support students and student athletes, he attempts to “build a bridge from the Ivory academic tower” to actual implementation and practice of his theoretical work and pedagogy. Dr. Albert Yves Bimper, Jr.